…all this in the streets, inside theatres, in cloisters and courtyards, in castles and cathedrals, in caves and taverns… everywhere earning unanimous approbations. Vocal and instrumental music from the sources of the centuries 11th up to 15th, evidence of the different contexts existing in the cultural and social life of the Middle Ages: The Court with the songs of Troubadours, Touvères, Minnesanger, gallego-portuguese poets and the instrumental music devoted to the dance; the Popular Devotion with the Cantigas de Santa Maria, the chants of Llibre Vermell and the Franciscan Lauds; the Festivity and the Goliardery with pieces from Festum Stultorum and Carmina Burana. Ever since early Middle Ages streets of Southern Italy were crossed with tracks leading pilgrims from all Europe to the places of embarkation towards the Holy Land. These routes, as well as the Francigena Way, coincided with ancient Roman roads: the Appian Way and the Traiana Way, the two most important routes linking Rome to Brindisi. Besides these two principal ones, there were minor ways, but very frequented as well. Among them a diverticulum (i.e. side lane) of the Appian-Traiana Way, that passing through the Gargano lead to Sanctuary of San Michele in Monte Sant’Angelo, a very important place of worship during Middle Ages. In Apulia the Francigena Way reached towns, sanctuaries, monasteries, abbeys, such as Troia, Lucera, San Severo, Santa Maria di Stignano, San Marco in Lamis, San Matteo, S. Giovanni Rotondo, Monte Sant’Angelo, Siponto, San Leonardo, Foggia, Incoronata, Cerignola, Canosa, Barletta, Trani, Molfetta, Ruvo, Bitonto, Bari, Monopoli, Egnatia, Fasano, Ostuni, Brindisi and Otranto. This important pilgrimage route was, on its turn, part of a much wider network of European “paths of faith” which had as principal junctions Santiago de Compostela, Rome and, overseas, Jerusalem (Peregrinationes Maiores). The Capitanata (i.e. the Northern part of Apulia), the Gargano and the whole Apulia came to be in the centre of that ideal axis symbolizing the triptych Man – Angel – God; Man being represented with the Sanctuary of San Pietro in Rome and Santiago de Compostela in Spain, Angel with the Archangel San Michele and God with the Holy Sepulchre in Jerusalem. Medieval musical sources have handed on to us some precious collections of tunes closely related to Spanish places of worship and to the theme of pilgrimage. The Liber Sancti Jacobi, contained in the Codex Calixtinus (12th cent.) from the Monastery of Compostela, presents a section dedicated to songs in honour of Saint Jacob. The Cantigas de Santa Maria represent instead a corpus of more than 400 Galician-Portuguese composition dedicated to the Holy Virgin and her miracles. These works were collected according to the will of Alfonso X “El Sabio” (i.e. the wise), in the second half of the 13th cent. and deal with miraculous episodes told by the viatores (i.e. the travellers) going to the holy sites; events happened in different parts of Europe, among which we find some of Southern Italy and Apulia. An other, though briefer, Spanish collection of devotional songs (in Latin, Catalan and Provençal ) is linked to the Marian Monastery of Montserrat and contains nine songs included in the 14th cent. manuscript known as Llibre Vermell ( i.e. the Red Book). In Italy during the second half of the 13th cent. it was just the popular devotion to give birth to the most ancient collection of Italian music in the vernacular, the Laudario di Cortona. This is a book containing the devotional chants of the laical confraternities which rose collaterally to the new genre of Gospel message offered by the Franciscans and the Mendicanti. The Franciscan spirituality, in particular, provided for the acceptance of an “earthly register” within the praise of the Creator and so it fostered a conception of music as an expression of the meeting between the Religious and the Profane. 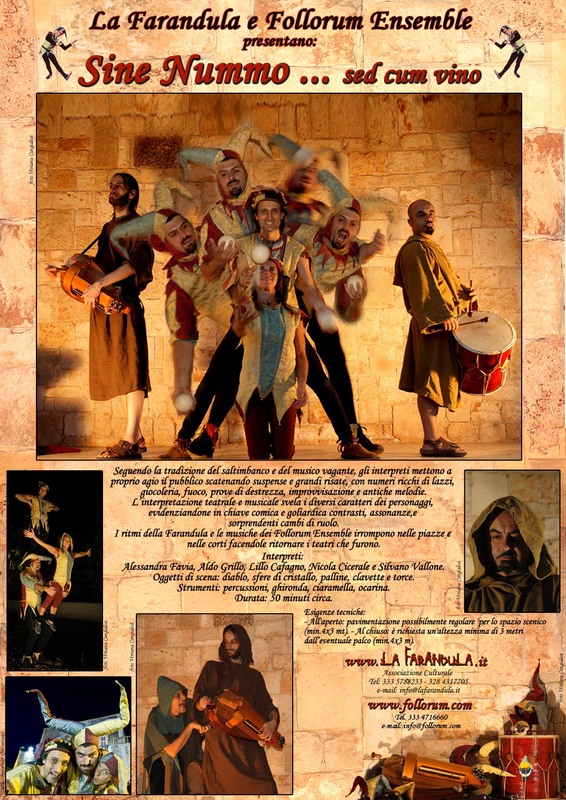 The musical programme offered by the Follorum Ensemble means to propose a choice of compositions taken from these important monuments of Medieval music in order to hold the attention towards ancient human paths alive; those same human paths which used to meet often spiritual ones, and still do so within Europe, and which witnessed the South of Italy as a significant passageway and land of cultural exchange. Following the tradition of the Tumbler and the roaming Musician, the actors make the audience comfortable setting suspense and hearty laughs with numbers full of jokes, jugglery, fire, proof of skilfullness, improvisations and ancient melodies. The theatrical and musical interpretation reveal the different characters, pointing out in a comic and goliardic key differences, assonances and surprising changes of role. The rhythm of the Farandula and the music of Follorum Ensemble swarm into the squares and courtyards making become them again the theatres of ancient times.